The Atlantic Ocean is the second-largest of the world's oceanic divisions; with a total area of about 41.1 million square miles (106.4 million square kilometers), it covers approximately one-fifth of the Earth's surface. Its name, derived from Greek mythology, means the "Sea of Atlas." The oldest known mention of this name is by Herodotus in his The Histories of around 450 B.C.E. (I 202). Although the Atlantic basin was in many ways the world center of commerce in the colonial period and into the twentieth century, many signs suggest a shift of the world center of commerce to the Pacific basin in the twenty-first century. Highly productive fisheries of the Atlantic have been severely overfished in the twentieth century and the development of industrial scale fish farming raises further issues about maintaining healthy wild fisheries. Because of the long-standing cultural ties among nations of the Atlantic rim, they have the potential—if they cooperate toward a shared purpose—of becoming world role models in developing approaches for sustainable exploitation of shared resources. The Atlantic Ocean is bounded on the west by North and South America. In the north and northeast, it is separated from the Arctic Ocean by the Canadian Arctic Archipelago, Greenland, Iceland, Jan Mayen, Svalbard, and mainland Europe. It connects to the Arctic Ocean through the Denmark Strait, Greenland Sea, Norwegian Sea, and Barents Sea. To the east, the boundaries of the ocean are Europe, the Strait of Gibraltar (where it connects with the Mediterranean Sea, one of its marginal seas, and, in turn, the Black Sea), and Africa. In the southeast, the Atlantic merges into the Indian Ocean, the border being defined by the 20° East meridian, running south from Cape Agulhas to Antarctica. While some authorities show the Atlantic Ocean extending south to Antarctica, others show it as bounded to the south by the Southern Ocean . In the southwest, the Drake Passage connects it to the Pacific Ocean. A man-made link between the Atlantic and Pacific is provided by the Panama Canal. 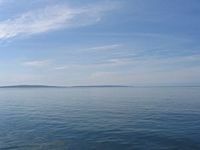 In addition to those mentioned, other large bodies of water adjacent to the Atlantic are the Caribbean Sea, the Gulf of Mexico, Hudson Bay, the Mediterranean Sea, the North Sea, and the Baltic Sea. With its adjacent seas the Atlantic Ocean occupies an area of about 41.1 million square miles (106.4 million square kilometers); without them, it has an area of 31.8 million square miles (82.4 million square kilometers). The land area that drains into the Atlantic is four times that of the drainage areas feeding into either the Pacific or Indian oceans. The volume of the Atlantic Ocean with its adjacent seas is 85.1 million cubic miles (354.7 million cubic kilometers) and without them 77.6 million cubic miles (323.6 million cubic kilometers). The average depth of the Atlantic, with its adjacent seas, is 10,932 feet (3,338 meters); without them it is 12,881 feet (3,926 meters). The greatest depth, 28,232 feet (8,605 meters), is in the Puerto Rico Trench. The width of the Atlantic varies from 1,770 miles (2,848 kilometers) between Brazil and Liberia to about 3,000 miles (4,830 kilometers) between the United States and northern Africa. The principal feature of the bottom of the Atlantic Ocean is a submarine mountain range called the Mid-Atlantic Ridge extending from Iceland in the north to approximately 58° south latitude and having a maximum width of about 1,000 miles (1,600 kilometers). A great rift valley also extends along the ridge over most of its length. The depth of water over the ridge is less than 8,900 feet (2,700 meters) in most places, and several mountain peaks of the ridge rise above the water to form islands. The South Atlantic Ocean has an additional submarine ridge, the Walvis Ridge. 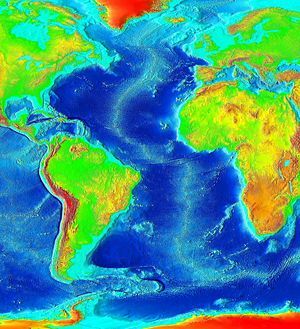 The Mid-Atlantic Ridge separates the Atlantic Ocean into two large troughs with depths averaging between 12,000 - 18,000 feet (3,700 - 5,500 meters). Transverse ridges running between the continents and the Mid-Atlantic Ridge further divide the ocean floor into numerous basins, some of the larger ones being the Guiana, North American, Cape Verde, and Canaries basins in the North Atlantic and the Angola, Cape, Argentina, and Brazil basins in the South Atlantic. The deep ocean floor is thought to be fairly flat, although it is punctuated with numerous seamounts, some of which are guyots, and also by several deeps or trenches. The Puerto Rico Trench in the North Atlantic is the deepest with a depth of 28,232 ft (8605 meters), followed by the South Sandwich Trench in the South Atlantic with a depth of 27,651 feet (8,428 meters) and the Romanche Trench near the equator with a depth of about 24,455 feet (7,454 meters). One additional major trench is the Laurentian Abyss off the eastern coast of Canada. The shelves along the margins of the continents constitute about eleven percent of the bottom topography and they are cut through by several deep channels. Ocean sediments comprise terrigenous, pelagic, and authigenic materials, which are so identified based on their origin and location on the sea floor. Terrigenous deposits formed by erosion, weathering, and volcanic activity on land and then washed to sea comprise sand, mud, and rock particles resting primarily on the continental shelves. Terrigenous deposits are thickest off the mouths of large rivers or off desert coasts. Pelagic deposits, covering the sea floor in the deep waters far from shore are of two general types: the red clays resulting primarily from dust that has settled on the water, and the oozes, which are the remains of organisms that sink to the ocean floor. Depending on the predominant types of organisms forming them, the oozes are either calcareous or siliceous. Covering most of the ocean floor and ranging in thickness from 200 to 11,000 feet (60 to 3,300 meters), pelagic deposits are thickest in the convergence belts and in the zones of upwelling. Authigenic comprise materials such as manganese nodules that occur where sedimentation proceeds slowly or where currents sort the deposits. On average, the Atlantic is the saltiest of the world's major oceans; the salinity of the surface waters in the open ocean ranges from 33 to 37 parts per thousand (3.3 - 3.7 percent) by mass and varies with latitude and season. Surface salinity values are influenced by evaporation, precipitation, river inflow, and melting of sea ice. Although the minimum salinity values are found just north of the equator (because of heavy tropical rainfall), in general the lowest values are in the high latitudes and along coasts where large rivers flow into the ocean. Maximum salinity values occur at about 25° north and south of the equator, in subtropical regions with low rainfall and high evaporation. Surface water temperatures, which vary with latitude, current systems, and season and reflect the latitudinal distribution of solar energy, range from 28 - 84°F (−2 - 29°C). Maximum temperatures occur north of the equator, and minimum values are found in the polar regions. In the middle latitudes, the area of maximum temperature variations, values may vary over the course of the year by 13 - 14°F (7 - 8°C). 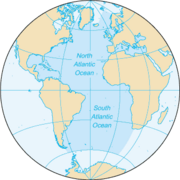 Based on such factors as temperature, salinity, and location of origin, the Atlantic Ocean's four major water masses are: the North and South Atlantic central waters constituting primarily the open ocean surface waters; the sub-Antarctic intermediate water extending to depths of 3,300 feet (1,000 meters); the North Atlantic Deep Water reaching depths of as much as 13,200 feet (4,000 meters); and the Antarctic Bottom Water occupying ocean basins at depths greater than 13,200 feet (4,000 meters). The Atlantic Ocean's climatic zones vary with latitude: The warmest climatic zones stretch across the Atlantic north of the equator, while the coldest zones are in the high latitudes corresponding to the areas covered by sea ice. Ocean currents contribute to climatic control by transporting warm and cold waters to other regions. Adjacent land areas are affected by the winds that are cooled or warmed when blowing over these currents. The Gulf Stream, for example, warms the atmosphere of the British Isles and north-western Europe, and the cold water currents contribute to heavy fog off the coast of north-eastern Canada (the Grand Banks area) and the north-western coast of Africa. In general, winds tend to transport moisture and warm or cool air over land areas. The average wavelength towards the North America shore about 1650 feet (500 meters) out is 1000. Tropical cyclones (hurricanes) develop anywhere from off the coast of Africa near Cape Verde to the Windward Islands and move westward into the Caribbean Sea or up the east coast of North America; hurricanes can occur from May to December but are most frequent from late July to early November. Storms are common in the North Atlantic during northern winters, making ocean crossings more difficult and dangerous. The Atlantic Ocean appears to be the second youngest of the world's oceans, after the Southern Ocean. Evidence indicates that it did not exist prior to 130 million years ago, when the continents that formed from the breakup of the ancestral super-continent, Pangaea, were being rafted apart by the process of seafloor spreading. Christopher Columbus (Genoa?, 1451 – May 20, 1506, Valladolid, Spain) was a navigator and colonialist. It was Columbus' voyages that led to a general European awareness of the hemisphere, and the successful establishment of European cultures in the New World. On the evening of August 3, 1492, Columbus departed from Palos with three ships. Columbus first sailed to the Canary Islands, which was owned by Castile, where he restocked the provisions and made repairs, and on September 6, he started what turned out to be a five-week voyage across the ocean. Land was sighted at 2 a.m. on October 12, 1492 and Columbus called the island (in what is now the Bahamas) San Salvador, although the natives called it Guanajani. Exactly which island in the Bahamas this corresponds to is an unresolved question; prime candidates are Samana Cay, Plana Cays, or San Salvador Island (named San Salvador in 1925 in the belief that it was Columbus's San Salvador). Columbus also explored the northeast coast of Cuba (landed on October 28) and the northern coast of Hispaniola, by December 5. After Columbus, European exploration rapidly accelerated, and many new trade routes were established. As a result, the Atlantic became and remains the major artery between Europe and the Americas (known as transatlantic trade). Numerous scientific explorations have been undertaken, including those by the German Meteor expedition, Columbia University's Lamont Geological Observatory, and the United States Navy Hydrographic Office. 986 – The Norse explorer Bjarni Herjólfsson sights the mainland of the Americas, becoming the first known European to do so. 1492 - Christopher Columbus traveled westward across the Atlantic. 1498 - The Portuguese navigator Vasco da Gama traveled all the way down the Atlantic coast of Africa and around Africa to India, establishing a trade route to India. 1520 - Ferdinand Magellan led a Spanish expedition across the Atlantic and around South America to the Pacific Ocean. 1553 – An English expedition discovered the White Sea and established a trade route to Russia. 1858 - The first transatlantic telegraph cable was laid by Cyrus Field. April 14, 1912 - The RMS Titanic sank after hitting an iceberg with loss of 1,593 people. 1919 - The American NC-4 became the first airplane to cross the Atlantic (though it made a couple of landings on islands along the way). Later in 1919 - a British airplane piloted by Alcock and Brown made the first non-stop transatlantic flight, from Newfoundland to Ireland. 1921 - The British were the first to cross the North Atlantic in an airship. 1922 - The Portuguese were the first to cross the South Atlantic in an airship. January 7, 1927 - The first transatlantic telephone call was made. 1927 - Charles Lindbergh made the first solo non-stop transatlantic flight in an airplane (between New York City and Paris). 1952 - Ann Davison was the first woman to single-handedly sail the Atlantic Ocean. 1994 - Guy Delage was the first man to swim across the Atlantic Ocean, from the Cape Verde islands to Barbados. 1998 - Benoit Lecomte was the first man to swim across the northern Atlantic Ocean, stopping for only one week in the Azores. December 3, 1999 - After rowing for 81 days and 2,962 miles (4,767 kilometers), Tori Murden became the first woman to cross the Atlantic Ocean by rowboat alone when she reached Guadeloupe from the Canary Islands. Islands in the Atlantic Ocean include Greenland, Iceland, Faroe Islands, The British Isles (including Great Britain, Ireland and numerous surrounding islands), Rockall, Newfoundland, Sable Island, Azores, Madeira Islands, Bermuda, Canaries, West Indies, Cape Verde Islands, Sao Tome e Principe, Annobon, St. Peter and Paul Rocks, Fernando de Noronha, Atol das Rocas, Ascension, St. Helena, Trindade and Martim Vaz, Tristan da Cunha, Gough Island, Falkland Islands, Tierra del Fuego, South Georgia Island, South Sandwich Islands, and Bouvet Island. Natural resources in the Atlantic include petroleum and gas fields, fish, marine mammals (seals and whales), sand and gravel aggregates, placer deposits, polymetallic nodules, and precious stones. Icebergs are common in the Davis Strait, Denmark Strait, and the northwestern Atlantic Ocean from February to August and have been spotted as far south as Bermuda and the Madeira Islands. Ships are subject to superstructure icing in extreme northern Atlantic from October to May. Persistent fog can be a maritime hazard from May to September, as can hurricanes north of the equator (May to December). Endangered marine species of the Atlantic Ocean include the manatee, seals, sea lions, turtles, and whales. Drift net fishing is killing dolphins, seabirds such as albatrosses, petrels, and auks, hastening the decline of fish stocks, and contributing to international disputes . Marine pollution is a generic term for the harmful entry into the ocean of chemicals or particles. The biggest culprit are rivers that empty into the ocean, and with them the many chemicals used as fertilizers in agriculture as well as waste from livestock and humans. The excess of oxygen-depleting chemicals in the water leads to hypoxia and the creation of a dead zone. Pollution threats are abundant. They include: municipal sludge pollution off the eastern United States, southern Brazil, and eastern Argentina; oil pollution in the Caribbean Sea, Gulf of Mexico, Lake Maracaibo, Mediterranean Sea, and North Sea; and industrial waste and municipal sewage pollution in the Baltic Sea, North Sea, and Mediterranean Sea. ↑ Limits of Oceans and Seas. International Hydrographic Organization Special Publication No. 23, 1953. Retrieved July 20, 2007. ↑ Steve Sullivan, and Stephen Krensky. (1991) Who Really Discovered America? (Hastingshouse/Daytrips Publ. ISBN 080389306X), 36. ↑ The Applied History Research Group. "The Atlantic Islands," European Voyages of Exploration, The University of Calgary, 1997. Retrieved July 13, 2007. ↑ Robert Eisenbud. Problems and Prospects for the Pelagic Driftnet . animallaw.info. Retrieved February 7, 2008. ↑ Christopher JoyceAtlantic Ocean's 'Heat Engine' Chills Down "All Things Considered," National Public Radio, Nov. 30, 2005. Retrieved July 20, 2007. Much of this article comes from the public domain site http://oceanographer.navy.mil/atlantic.html (dead link). It is now accessible from the Internet Archive at Commander, Naval Meteorology and Oceanography Command, Stennis Space Center, Mississippi, USA. Retrieved July 20, 2007. Disclaimers for this website, including its status as a public domain resource, are recorded on the Internet Archive at Commander, Naval Meteorology and Oceanography Command, Stennis Space Center, Mississippi, USA. Retrieved July 20, 2007. Atlantic Ocean CIA – The World Factbook. This page was last modified on 23 April 2016, at 20:55.